Caption: Don't even think about replacing every section label with 'Knickers' !!! Filename: 'My Lucky Day ! " Caption: "thank goodness i'm wearing stockings and knickers !" Caption: Our Miss Jones is helping raise funds for the library @ $100 a spin I need more money cause I'm broke! Caption: I'd like to buy a vowel...a big "O"! Caption: "So after this game Vicar I am guessing you have me lined up to play strip poker, with you having a loaded hand and then naked twister"? Caption: Everyone's a winner with this hot game! 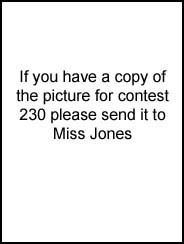 But only Miss Jones appears to be losing (her clothes)! !